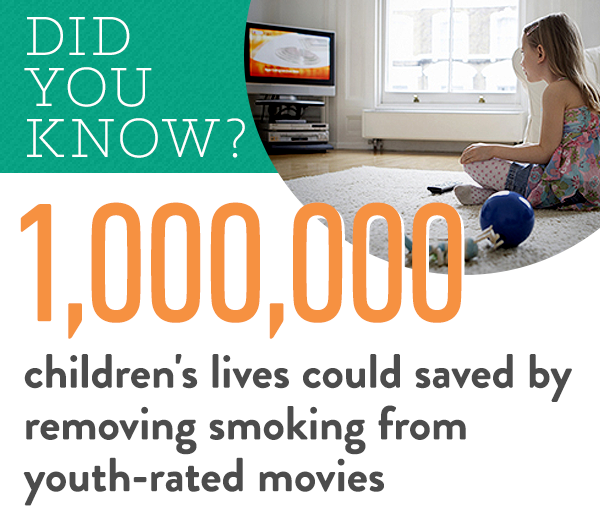 Making kid-rated movies smoke-free would prevent one million tobacco deaths in this generation of U.S. kids. Hollywood studios and their parent entertainment companies are well aware of the public health risk, but continue to expose millions of kids to tobacco. As You Sow has launched Tobacco Free Funds, an innovative search platform that makes it easy to find out if your money is invested in the tobacco industry or in entertainment companies that promote tobacco use. Entertainment companies promote smoking by showing tobacco in movies. These tobacco images cause kids to begin smoking, according to the US Surgeon General and CDC. In 2015, 38% of top-grossing kid-rated movies (P, PG, and PG-13) featured smoking. Keeping tobacco out of kid-rated movies would prevent more than 1,000,000 tobacco deaths in this generation of kids according to public health experts. Investors worth $64 billion have joined As You Sow’s open letter to the entertainment industry, urging the industry to make kid-rated movies smoke-free link. TRY IT NOW: Search your investments for tobacco companies and entertainment companies that promote smoking. The Walt Disney Company has become the first major Hollywood studio to prohibit cigarette smoking depictions in films they produce with youth ratings. The company’s new policy will limit smoking depictions to films with an R rating, a move the U.S. Surgeon General has said could save the lives of over 1,000,000 children if the entire industry followed suit. The new policy covers all films that Disney produces, but disappointingly does not extend to films the company distributes. TAKE ACTION: Tell Time Warner to take smoking out of youth-rated movies! Disney is showing their leadership by taking action on the Surgeon General and CDC report by implementing a policy with direct impact on this public health crisis. The next critical step will be to publicly endorse an MPAA policy to require an R rating for all films depicting smoking. A coalition of investors, including As You Sow and faith-based shareholders Trinity Health and Sisters of St. Francis (part of the Interfaith Center on Corporate Responsibility) have engaged in dialogue with Disney and other studios on the issue of tobacco impressions in films for over a decade. Time Warner, parent company of Warner Bros. movie studio, has become the first company to hold a shareholder vote on smoking in movies. The resolution was submitted by As You Sow and non-profit healthcare provider Trinity Health. At the recent Walt Disney annual meeting, Disney CEO Bob Iger announced that Disney would prohibit smoking in all future films. Disney is the first major movie studio to make such a public announcement, although the language of the policy has not yet been released. Add your name today to urge Time Warner to take smoking out of youth-rated movies! Shareholders are concerned that this data, and the publicity it has received, put the movie studios’ reputation at risk, and could hurt the companies’ long-term profitability. In September, As You Sow filed resolutions with Walt Disney and Viacom (parent company of Paramount Pictures). Resolutions were filed in December at Comcast (parent of NBC Universal) and Time Warner (parent of Warner Bros.). The resolutions at 20th Century Fox and Lion’s Gate Entertainment will be filed in spring 2015. Disney and Viacom appealed to the Securities and Exchange Commission (SEC) that the shareholder resolutions not be voted on. The filers of the resolutions (As You Sow, Sisters of St. Francis of Philadelphia, and Province of St. Joseph of the Capuchin Order) filed a counter-brief with the SEC. Despite the fact that smoking is the leading cause of preventable death in the country, and scientific literature demonstrates that 18% of youth smoking is caused by exposure to smoking in youth-rated movies, the SEC did not believe that the issue was significant enough to warrant a response from the company. Comcast and Time Warner have not yet challenged the resolutions that they received. (Read the SEC decision, and the briefs submitted by all parties here). Between 2005 and 2012, dialogues between Hollywood studios and shareholders resulted in each of the major studios creating and adopting smoking in youth-rated movies policies regarding the oversight of tobacco portrayal in film. However, independent data shows that the number of tobacco impressions that each studio delivers to youth each year is inconsistent, demonstrating that the policies are ineffective. Shareholders want to maximize long-term profitability. Now that the Surgeon General’s report has publicized the fact that smoking in films will cause the deaths of 1,000,000 kids that are alive today, the studios must act to preserve their reputations, and demonstrate to shareholders that they will not ignore a crisis. In the Sept. 30, 2014 edition, the New York Times highlighted our Smoke-Free Movies shareholder resolutions with Hollywood studios. The major media companies are coming under renewed attack by a group of faith-based shareholders who say they want more progress in limiting the cigarette smoking that young people see in movies. At the urging of advocacy groups concerned about the power of movies to encourage young people to try cigarettes, Hollywood over the last decade has sharply reduced the amount of smoking imagery in youth-rated films. But the Motion Picture Association of America has resisted calls to give an automatic R rating to any movie that depicts smoking, citing the need for artistic license. In response, the Interfaith Center on Corporate Responsibility and the advocacy organization As You Sow have decided to step up the pressure by filing shareholder resolutions with the parent companies of the six major movie studios. “We think we’ve given the movie studios enough time,” said Sister Nora Nash of the Sisters of St. Francis of Philadelphia, one of the advocates leading the effort. Milwaukee, WI – Sept. 26, 2014 – Today faith-based shareholders, who are part of the Interfaith Center on Corporate Responsibility (ICCR) and the shareholder advocacy organization As You Sow, filed shareholder resolutions with The Walt Disney Company and Viacom (parent of Paramount) asking the Hollywood movie studios to respond to the Surgeon General and CDC report that an R rating of films with smoking imagery could save 1,000,000 lives. Oakland, CA – Jan. 17 2014 – The 50th anniversary Surgeon General’s Report on Smoking and Health, released today, called on Hollywood movie studios to eliminate images of smoking from youth rated movies, saying that doing so, “…could have a significant effect on preventing youth from becoming tobacco users and could save over a million lives.” Implementing this policy by modernizing the movie ratings system to give these films an R rating would, according to the report, reduce youth smoking by 18% and reduce smoking deaths significantly. In January 1964 the ninth Surgeon General, Dr. Luther Terry, laid the foundation for tobacco control efforts in the U.S. with the first Report on Smoking and Health. Through the efforts of tobacco control professionals, advocates, and researchers the work has continued to move forward with clean indoor air laws, taxes that increased the price of tobacco products, warning labels, and the elimination of TV advertising. “Thanks to the television broadcast ad ban, movies remain the most important mass media channel addicting kids to cigarettes,” says Andrew Behar, CEO of As You Sow. Exposure to onscreen smoking in movies is the single largest factor promoting youth smoking in the United States, accounting for about 44% of all new smokers. In 2012, the U.S. Surgeon General reviewed extensive scientific literature and concluded that exposure to smoking on screen causes kids to smoke. This seminal report concluded that an R-rating for future movies with smoking would lower teen smoking rates by 18 percent and prevent one million tobacco deaths among kids alive today. In July 2017, CDC’s Morbidity and Mortality Weekly Report (MMWR) noted that “the steady decline in the number of tobacco incidents in youth-rated movies from 2005–2010 stopped after 2010” and re-affirmed the necessity for R-rating movies with smoking. The CDC report, covered in the New York Times, credited investors with helping to reduce tobacco imagery in kid-rated movies. However, the Motion Picture Association of America, the trade group for the major studios that governs the US movie rating system, has repeatedly refused to adopt the R-rating for smoking. In August 2017, 17 leading U.S. health organizations (including American Cancer Society and medical organizations representing more than 630,000 doctors) demanded that movie producers, distributors and exhibitors apply an R rating to all films that include depictions of smoking or tobacco. Disney strengthened its tobacco policy in 2015 to “prohibit smoking in movies across the board [in] Marvel, Lucas, Pixar [and] Disney films.” Disney’s policy still allows smoking in movies distributed under its Touchstone label, most recently used to market DreamWorks productions. In 2016, only one out of 13 youth-rated films released by Disney included tobacco imagery. By 2013, all major movie studios or their parent companies had adopted tobacco depiction policies that may discourage but do not eliminate smoking in their youth-rated movies. Sizeable loopholes in these policies, such as allowing smoking for “creative” reasons, have prevented smoking incidents in PG-13 films industry-wide from falling since 2010. In 2016, more than one in three PG-13 movies from MPAA-member studios still featured smoking. Among the major studios, Sony ranks as the smokiest: 44 percent of Sony’s youth-rated movies from 2013 to 2016 feature smoking. Lionsgate follows with 41 percent of youth-rated movies showing tobacco use. By comparison, Disney and Disney owned labels showed tobacco use in 12% of their movies over the past five years. All other studios (Universal, Fox, Paramount, and Warner Bros.) had between 28-38% of movies with tobacco use — at least double that of Disney. See the full data comparing studios here.